During Mobility 21’s annual advocacy trip to Washington, D.C. next week, leaders will advocate for increased federal investment in goods movement infrastructure. During Mobility 21’s annual advocacy trip to Washington, D.C. next week, Southern California’s leading transportation and business stakeholders will join together to advocate for increased federal funding for transportation and innovative tools to maximize local investment in infrastructure. Federal funding to improve and maintain Southern California’s aging goods movement infrastructure will take top billing during the advocacy trip. More than 43 percent of the nation’s containerized imports enter the Ports of Long Beach, Los Angeles, Hueneme and San Diego — creating jobs, income and tax revenue in all 50 states. Given Southern California’s role as America’s trade gateway, Mobility 21 members will advocate for federal investment to improve the flow of trade to the rest of the nation, as well as to mitigate the congestion and air quality issues that are caused by the movement of goods through Southern California’s ports, highways and railways. Click here to view Mobility 21’s legislative briefing materials online. Check out next month’s e-newsletter for a wrap-up of the advocacy trip. Follow Mobility 21 on Twitter and Facebook for updates and photos from the trip. 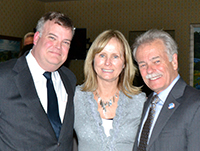 OCTA CEO Will Kempton’s career has spanned nearly 40 years in transportation, public service and government affairs. 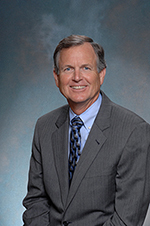 Mobility 21 Board Member Will Kempton is retiring today from the Orange County Transportation Authority (OCTA) after three and a half years at the helm as CEO. 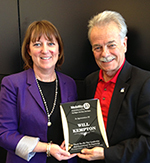 After retirement, Kempton will head to Sacramento to lead the nonprofit organization Transportation California. 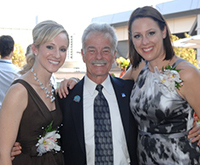 This month, we asked some of Kempton’s closest colleagues and family members to reflect on the mark he leaves on transportation. What is Will Kempton’s legacy to transportation in California? “Aside from any transportation improvements he has worked on for the people of California, I personally believe his biggest legacy was how he honestly cared for his employees and how that inspired and motivated them. I speak from experience myself with managers throughout my career when I state that I know how much that means to employees. I always admired this quality in my husband. “I think that over his 30 plus years as a transportation professional, Will leaves California with a policy of dealing better with ever-shrinking funds and ever-increasing demands. At OCTA he was able to manage through a recession that could have cost us much more transportation service, and left us with a deficit we could not overcome. 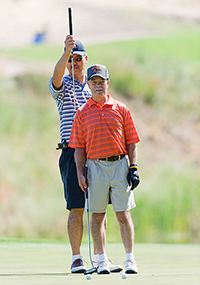 What is your fondest memory of working with Will Kempton? “Serious: A few years back, when OCTA was strapped with budget restraints and faced with laying off a number of bus drivers and buses to cut costs, an excellent public-private partnership was born between OCTA and the Disneyland Resort. Disneyland President George Kalogridis came to Will with a need for more guest transportation, and with that the OCTA buses and drivers intended for layoff were moved to the resort. This innovative solution is a great example of a public-private partnership that saved jobs, benefited both organizations, and is a stamp on Will’s legacy to the county. Not so serious: Will loves collecting “hardware” or prizes and awards for his team’s efforts. I made him wait a year to earn OCBC’s coveted “Turning Red Tape to Red Carpet” award—his “Getting Results” provision was proposed, but not yet passed by Congress with MAP-21. OCBC doesn’t give awards for ideas, but for actual implementation and measurable results! He was annoyed with me! But once MAP-21 passed, and benefits felt, he earned the “big one” from OCBC in November 2012! Each year the UCLA Luskin School of Public Affairs hosts a daylong event to expose students to real-life challenges facing Los Angeles. Students from the UCLA Luskin School of Public Affairs gathered at the Los Angeles City Hall on Feb. 8 to research and talk to stakeholders about the future of transportation funding. “Full Speed Ahead: Creative Solutions to L.A.’s Transportation Needs,” was the ninth annual UCLA Luskin Day at Los Angeles City Hall, hosted by Los Angeles Controller Wendy Greuel. Students heard from a panel of experts on Los Angeles’ transportation challenges and had the opportunity to interview government, private sector and nonprofit leaders, including Mobility 21 Executive Director Marnie O’Brien Primmer. 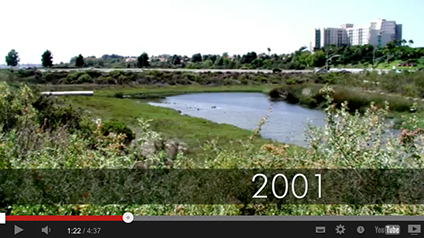 Watch a video on the water quality measures planned for the 241 Tesoro Extension. The Foothill/Eastern Transportation Corridor Agency is requesting a permit from the San Diego Regional Water Quality Control Board for the State Route 241 Tesoro Extension. The permit verifies that the 241 Tesoro Extension will minimize and offset any potential impacts to waterways. The agency also has additional project features that go above and beyond standard construction requirements. A five-minute, comprehensive video http://www.youtube.com/TheTollRoadsOC was created to showcase the state-of-the-art water quality measures planned for the project. An outreach campaign is underway to generate awareness of and support for the 241 Tesoro Extension’s water quality measures. 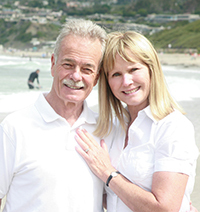 Bill Bennett, one of Mobility 21‘s first Advisory Board Members, retired this week after a successful career as a professional engineer and a private sector engineering consultant in Southern California. Since 2004, Bennett has served as Senior Vice President and Southern California Area Manager for HDR, providing vision and leadership for the firm’s Southern California offices. 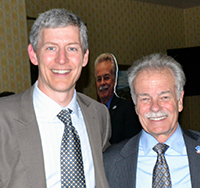 Join Mobility 21 in thanking Bennett for his tremendous support of the coalition’s mission to improve transportation in Southern California and congratulate him on his retirement. Following the successful opening last year of the Metro ExpressLanes demonstration program along the Harbor Freeway, 14 miles of Metro ExpressLanes debuted on the I-10 San Bernardino Freeway Saturday, Feb. 23. The new ExpressLanes stretch between the I-605 Freeway and Union Station/Alameda Street near downtown Los Angeles. ExpressLanes are High Occupancy Toll (HOT) lanes that allow solo drivers to use the lanes for a toll. The one-year ExpressLanes demonstration program is designed to reduce congestion by improving travel choices. The first set of lanes opened in November on the I-110 Harbor Freeway between the 91 Freeway and Adams Boulevard. More than 100,000 FasTrak ExpressLanes transponders have been issued since July, 2012. Carpools, vanpools and solo drivers must have a FasTrak transponder to travel in the ExpressLanes. On the I-10 freeway, an additional ExpressLane has been constructed in each direction between the 605 and the 710 freeways to add capacity along that heavily traveled corridor. 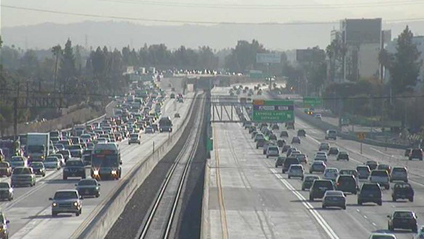 Prior to ExpressLanes, there was only one carpool lane operating in each direction along the El Monte Busway. With the opening of the I-10 ExpressLanes, the rules for carpools on the I-10 freeway will stay the same as they were before. Carpools are three or more people traveling during peak travel times of 5 a.m. to 9 a.m. and 4 p.m. to 7 p.m. Monday to Friday, with holidays excluded. During peak travel times, carpools of just two people can travel in the I-10 San Bernardino Metro ExpressLanes for a toll. All other times, they will travel toll-free in the ExpressLanes. The FasTrak transponder has settings for the driver to designate whether there are one, two or three or more passengers (1, 2 or +) in the vehicle because of the I-10 carpool rules. At all times on both the I-110 and I-10 freeways, the general purpose lanes are not tolled. But solo drivers will be required to pay a toll any time they use the ExpressLanes. Net toll revenues will be reinvested in the corridor where they are generated for transportation improvements. To prevent backups in the ExpressLanes, the tolls are adjusted from 25 cents a mile to a maximum of $1.40 a mile and will increase as the number of vehicles in the ExpressLanes.